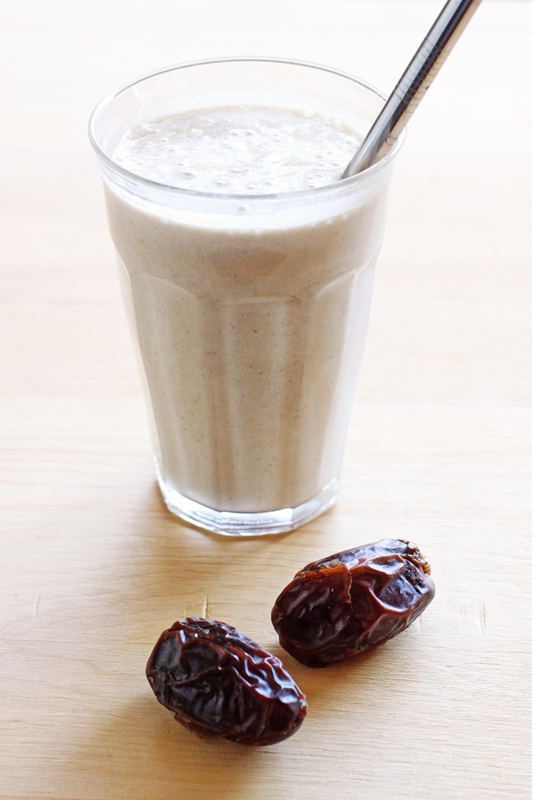 Have you ever had a date shake? A southern California staple, this creamy treat typically contains a blend of vanilla ice cream, whole milk and the sweet, caramel-like dates grown in the Coachella Valley. Date shakes are also a tradition in my family. My dad, who grew up in the desert, would whip them up almost every Sunday when I was a kid. Nick and I kept the tradition alive on our recent babymoon in Palm Springs, which included a mandatory trip to a date orchard to get our date-shake fix. If I give birth to a 10-pound baby, this decadent drink may be to blame. 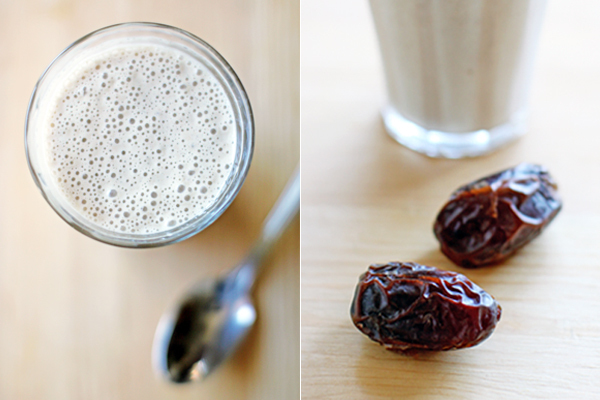 Thankfully, it’s possible to make a healthy version of the date shake at home. Dates are packed with potassium and fiber, making them a wonderful source of natural sweetness and a mainstay in many health-conscious desserts (see exhibits A, B and C). 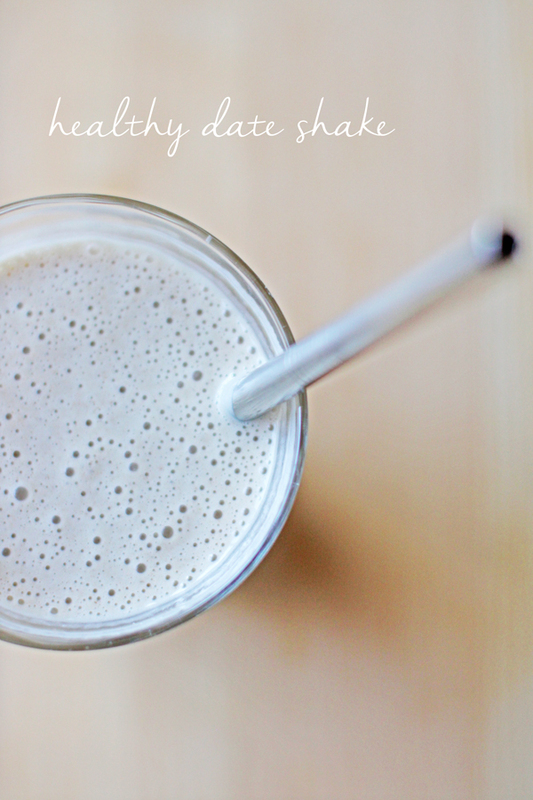 To thicken up this shake without ice cream, I used frozen banana (more potassium!) and raw cashew butter, which tastes like cake batter but better (no salmonella, way more protein). Almond milk adds calcium without dairy, while a little vanilla extract and sea salt finish things off in the flavor department. The result is a creamy, vanilla-caramel shake that’s actually good for you. And there’s even better news for expecting mamas. A study showed that women who ate dates during pregnancy had easier labors, so drink up! To shake things up, add a shot of espresso to make creamy date coffee, or blend in a teaspoon or two of raw cacao powder for a chocolate-flavored shake. Can't wait to try this shake! It looks so yummy! Thanks Julia. Wow, this sounds DIVINE! I'll try mine with a little cacao powder because #Chocolate. I've been whipping up the chocolate version all week because #pregnancycravings ;) I know you can relate! xoxo and congrats on your news!